After a five and a half hour flight from Canada we're about to land at Barbados International Airport. When approaching the Barbados International Airport along the West Coast of Barbados, it's always fun trying to see if I can pick out my barbados rental property. 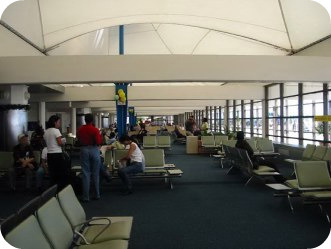 all the way to the airport gate, rain or shine which is the way it's done in the Caribbean. There is help available for those that require it, wheelchairs are provided by the individual airlines who will assist passengers on and off the plane. People needing help or wheelchairs should tell the airline they're traveling on in advance so proper arrangements can be made. There is also an elevator to the restaurant on the mezzanine above and disabled toilets are available. The arrival and departure halls are both on the ground floor making it easy for the disabled to get around. 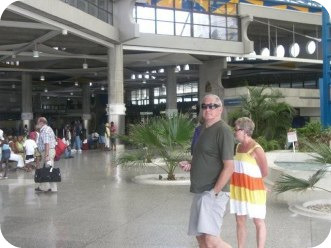 After the recent US100 million renovation the airport has really been brought up to date in many ways, the new improved check in facilities and new arrivals hall make the first impression of the Barbados International Airport much more pleasant. Do I need a passport or visa to visit Barbados? For information on Passports and Travel Visas visit Direct-PassportVisas.com the leading travel document site. 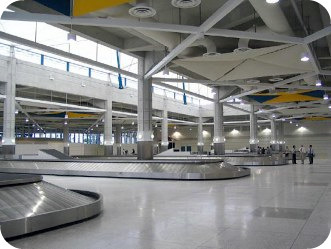 Once inside, the baggage claim area which is air conditioned and almost twice the size of what it used to be, getting your suitcases is a breeze, as long as the moving carousel that has the bags on it keeps moving. For help with your luggage there are an abundance of porters and I suggest getting one as it seems that everything goes a lot smoother, such as getting through customs, etc. As of May 2008 there are no trolleys for those that want to pick up their own bags. At least until May of 2008 there still weren't any, it would be nice to have them available especially on departure. What does Barbados customs allow me to bring into the country? Tip: If you're a smoker I've found that you can buy cigarettes much more cheaply at the incoming duty free shop at the Barbados airport rather than in my home airport duty free shop. It also carries a limited selection of liqueur. The shop is located just off immigration and has what I consider to be very good prices. The Barbados airport is in the South Eastern part of the Parish of Christ Church close to the tip of the Island if it was any further South it would be in the water. For those going to Bridgetown it's a very short trip only about 8 miles, but these days most of the visitors are heading further around the Island. 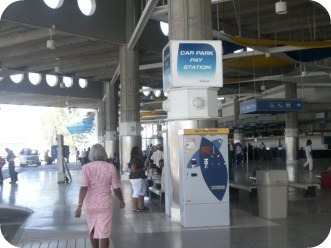 There are also taxis and mini vans as you exit Barbados International Airport that most visitors use, ask the fellow that calls up the taxi what it should cost to go to your destination. The taxi drivers seem to have a habit of high pricing. As an example, the last time I got a price for a cab from the driver he told me $55. I checked with the fellow that calls up the cabs at the entrance to the airport and he told the driver in no uncertain terms that $45 was the price and that settled that. Needless to say the driver was a little annoyed with me. For those people that feel the need of a more luxurious form of getting to their destination there are the options of taking a helicopter if their destination is Sandy Lane Hotel or taking a limousine. Take a limo for a more luxurious form of transportation to get to your destination. On departure the new Barbados International Airport departure lounge definitely leaves a good impression. 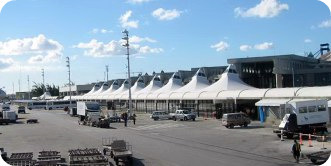 It's much more comfortable and provides easy access to, duty free shops, a few retail stores and snack bars. Tip: After the years of coming to Barbados one year my wife pointed out to me that if we're taking locally made rum back home it's cheaper to buy it at a grocery store instead of at a duty free shop. I couldn't believe it until I checked it out, and she was absolutely right(once again).